Are you trying so hard to find the satisfying software which can make MTS playback on Mac or other popular mainstream portable device? If so, you come to the right place! The MTS Converter for Mac is the professional but easy-to-use software which can convert MTS even TS, M2TS to any popular video format with unmatchable speed and fabulous quality. With its user-friendly interface, it's very easy to operate even for a beginner. Also it enables you to customize your video and audio with multiple functions. The video and audio output settings are adjustable as well. 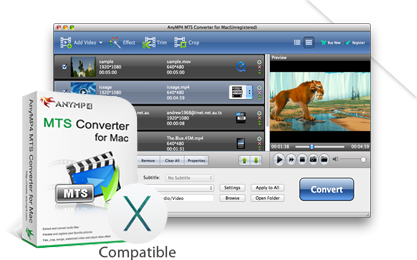 This powerful Mac MTS Converter can convert MTS, TS, M2TS videos to common video format like MP4, MOV, MKV, VOB, M4V, AVI, FLV, WMV, Webm, etc. You're enabled to extract audio tracks from MTS video and convert them to popular audio formats like MP3, M4A, AAC, AIFF, AC3 and more. With this powerful software, you can convert MTS videos to Mac Video Editing software like iMovie and Final Cut Pro and mainstream portable devices like iPod, iPad, iPhone, Google Nexus, Galaxy Tab, Galaxy S3, Nokia Lumia, HTC and more. Here with this Mac MTS Converter, you can adjust the video effect to get your perfect video effect. The video Brightness, Contrast, Saturation, Hue and Volume can be adjusted according to your desire. You're enabled to trim the video length by defining the start and end time. Also you can crop the black edge of the video and adjust the video frame as you like. Want to enjoy your favorite movies in one file? Merge function can make it for you. Adding text/image watermark will show your great taste in the video. Here you can adjust the video settings like Encoder, Frame Rate, Resolution, Aspect Ratio and Video Bitrate to meet your needs. What's more, the audio settings like Encoder, Sample Rate, Channels and Audio Bitrate are also adjustable according to your preference. You can select the subtitle and audio track if there're a few subtitles and audio tracks for you to select. It's a great pleasure to enjoy the movies with your favorite subtitle and audio track. You're enabled to select the output folder, snapshot folder and snapshot format as you like. Even if you don't have much computer knowledge, you can accomplish the conversion thanks to its user-friendly interface and simple design. 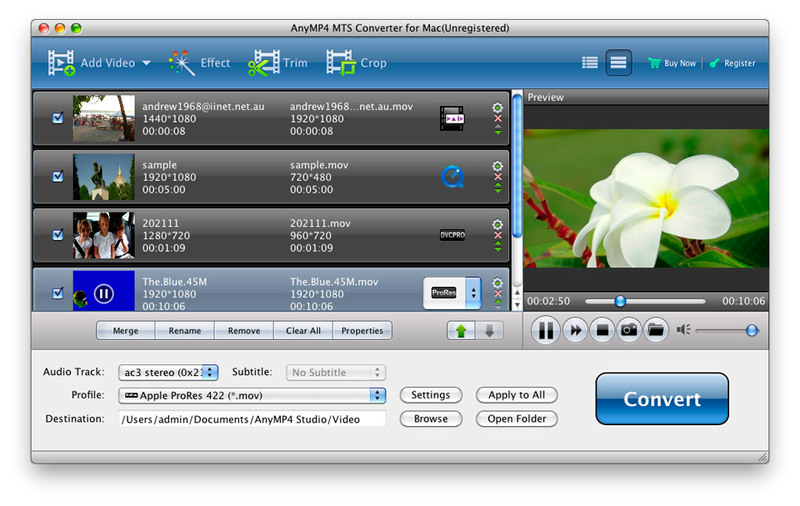 This best Mac MTS Converter grants you to preview the original and edited video effect. During the previewing process, you can take a snapshot of your favorite movie scene and save it on your computer for later use. If your computer is connected to the Internet, it'll automatically update the software if upgrades are available.